Capable of transporting up to 12 people, the ‘Autonom Shuttle’ was inaugurated in the presence of dignitaries representing the Department of Transport, Abu Dhabi Police, and the French Embassy. Also attending were Khaled Al Qubaisi, chief executive officer for Aerospace, Renewables and ICT at Mubadala Investment Company; Mohamed Jameel Al Ramahi, CEO of Masdar (Abu Dhabi Future Energy Company); Mohammed Darwish Al Qamzi, general manager of Integrated Transport Centre, Department of Transport in Abu Dhabi and Jérôme Rigaud, deputy CEO of Navya Group. Designed by the French autonomous vehicle pioneer Navya, the Autonom Shuttle is a self-driving electric vehicle dedicated to first and last-mile transportation. It carries up to 12 people with 8 seated, is fully autonomous and has a top operational speed of 25 kilometres per hour. "Masdar City is built on the three pillars of economic, societal and environmental sustainability and the introduction of our first Navya vehicle perfectly illustrates this philosophy in action," says Yousef Baselaib, executive director for Sustainable Real Estate at Masdar. "With urban mobility at the forefront of the sustainability conversation in the UAE and worldwide, and with the business, residential and research community here at Masdar City continuing to flourish, Masdar is building on its legacy as a catalyst for clean-tech innovation to bring cutting-edge and commercially viable autonomous mobility to the streets of Masdar City." 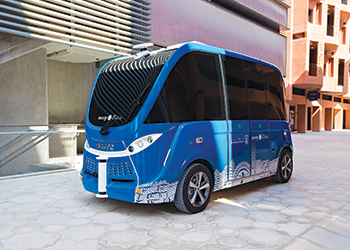 "Masdar City’s iconic Personal Rapid Transit (PRT) system, which has carried more than 2 million passengers in eight years of operations, established a benchmark for driverless and sustainable mobility in the UAE," added Baselaib. "The introduction of our first Navya shuttle represents the next exciting phase of the city’s mobility journey." The vehicle uses on-board cameras and sensitive LIDAR sensors creating 3D and 2D "perception maps" to detect obstacles and their position relative to the vehicle. GPS technology further allows the vehicle to define its precise location, as well as V2X to communicate with traffic lights. Al Qamzi says: "The arrival of autonomous mobility at Masdar has been the result of a highly successful collaboration between the DoT, Masdar and Navya, which has further raised the profile of Abu Dhabi as leader in environmental best practice and sustainable urban development. Today’s launch supports Abu Dhabi’s strategic aim to realise a world-class transportation system for the benefit of both residents and visitors, unlocking in the process further social and economic gains for the emirate of Abu Dhabi and the UAE."